Get your testimony ready! Two big waterfront items being discussed at the NYC City Council, Wednesday, 4/17/19. Creating a new Office of the Waterfront? Creating a new Director of Ferries and moving NYC Ferry control from the NYC EDC to the NYC DOT? TankerTime: Do you have any Slovenians? In this era of Charlottesville, anti-immigrant politics and Muslim bans, I want to share how PortSide NewYork is celebrating different cultures and bringing different people together. One of our means is music and evening TankerTime on the MARY A. WHALEN. In doing so, we continue the traditions of Red Hook and port districts in general. TankerTours! Congresswoman Nydia Velazquez presents us a Congressional Record! Great TankerTours day! We were honored to receive a Congressional Record from Congresswoman Nydia Velazquez. Councilman Carlos Menchaca spoke. Visitors included some 150 happy people and one dog. Need some POW! for a summer weekend? You can get that the second weekend in August during POW! 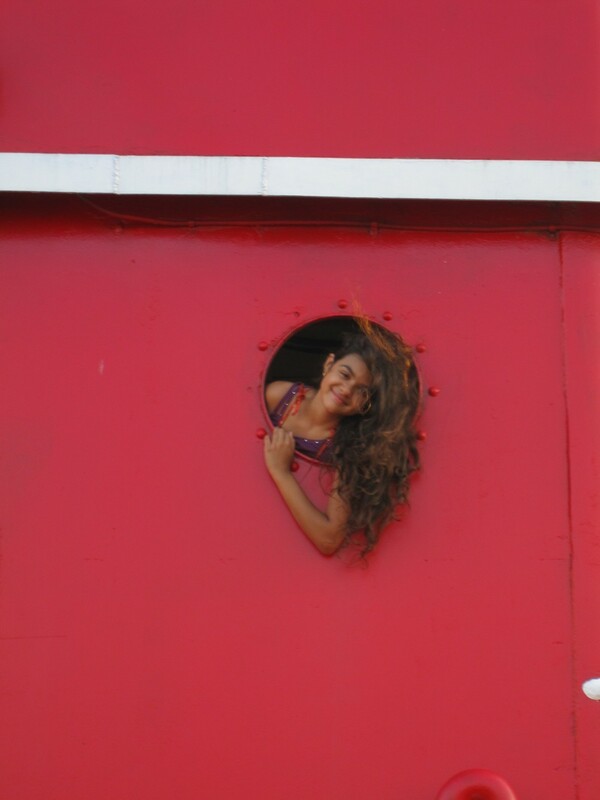 PortSide Open Weekend, when the waterfront non-profit PortSide NewYork opens their historic ship in Atlantic Basin for the first time in five years, offering free events from Friday night through Sunday night. All events are on the 77-year old tanker MARY A. WHALEN in historic Atlantic Basin, Red Hook, Brooklyn. Map of location HERE. Friday, 8/7/15 8pm-10:00pm, POW! kicks off with an “Artists for PortSide” event. Regula Küffer, flute, and Nick Perrin, guitar, were inspired to donate their “Nuevo Amenecer“ (“New Dawn“) concert after seeing the documentary “Stadt am Wasser“, featuring PortSide NewYork and the tanker MARY A. WHALEN, on European TV. The two Swiss musicians combine flamenco, chamber music, and jazz as they perform rumba, sevillana, tango, fandango and more. They promise a turtle, funny birds and surprises to boot. All music is written by Nick Perrin. “Nuevo Amenecer“ is the name of their new CD and what it means for PortSide NewYork to have this new long-term home in Atlantic Basin. In late May, PortSide started a three-year permit at this site, so stay tuned for future POW! events and more! Saturday, 8/8 and Sunday 8/9, 12:00-5:00pm, TankerTours of the MARY A. WHALEN are free to the public. The ship is the last of her kind in the USA and on the National Register of Historic Places. Learn PortSide WaterStories about the crew, how a Supreme Court decision about the ship revolutionized American maritime law. The huge galley is likely bigger than your apartment kitchen, the cast iron engine is a wonder, the bell boat communication system a surprise. 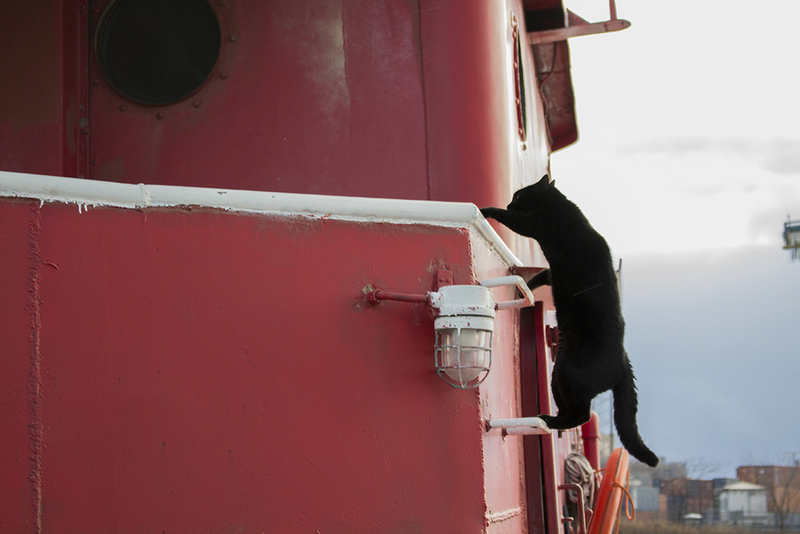 Play string with ship cat Chiclet, deemed one of NYC’s top mascots by Time Out NY. The Pioneer Works Center for Art + Innovation is partnering with PortSide NewYork during POW! Sign up for TankerTours at Pioneer Works, located at the corner of Pioneer and Conover Street, just one hundred yards from the ship. See the exhibits at Pioneer Works during your visit, which include 'Second Sundays' open studios and performances. TankerTours are run open-house style; you move through the ship at your own pace through spaces with docents. Great for kids. Flat soled shoes highly recommended. An array of maritime props will be available for you to take SaltySelfies. Saturday, 8/8, 6:00-10:00pm, kick back and relax, make like the tanker is your own during TankerTime aboard MARY A. WHALEN. The deck is set with tables, chairs and hammocks for you to lounge, bring take-out or your favorite bottle. You can sketch, photograph- or sing along! Folk Music Society of New York will have a sing along during this TankerTime. Regula Küffer, and Nick Perrin will perform "Nuevo amanecer"
Sunday, 8/9, 6:00-10:00pm, enjoy sunset and sea breezes and a neighborhood vibe. The deck will be set with 6’ tables for communal dining. It’s bring your own, and the community is encouraged to bring pot luck dinners and share. PortSide NewYork brings WaterStories to life. PortSide is a living lab for better urban waterways. We bring the community afloat and the community ashore closer together to the benefit of both through education, arts, preservation, advocacy and workforce programs, on and off our flagship, the historic tanker MARY A. WHALEN. PortSide was founded in 2005 and operated for ten years as a pop-up while looking for a home. May 29 this year, PortSide NewYork moved to its first long term home, starting a three year contract in Atlantic Basin, Red Hook. Our first POW! concert is thus fittingly named “Nuevo Amenecer“ (“New Dawn“). PortSide WaterStories can save lives and protect property; we refer to our resiliency work. Since Superstorm Sandy, PortSide has been active in recovery and resiliency. Our Sandy recovery work won us a White House “Champions of Change” award and honors from the New York State Senate. Our President Carolina Salguero was on the Red Hook committee of the NY Rising Program and contributed many elements to Red Hook’s resiliency plan. July 14, 2015, our MARY greets their MARY! PortSide NewYork joins Cunard 175th anniversary celebrations! PortSide NewYork is honored and excited to be part of Cunard's celebrations commemorating their 175th anniversary! Illustration by christina sun, creator of harbor blog "bowsprite"
Our flagship, the tanker MARY A. WHALEN will be part of a parade of historic ships greeting the arrival of Cunard's QUEEN MARY 2 (the QM2) Tuesday, July 14, 2015 at dawn. After passing by the Statue of Liberty, the QM2 will then dock at the Brooklyn Cruise Terminal in Red Hook. More info in Cunard's press release below. At 9:30pm that night, Cunard is staging a special light show with images beamed onto the ship while she is in front of the Statue of Liberty. This should be visible from Red Hook, Governors Island and lower Manhattan. It is fitting that our MARY should salute their MARY, since our MARY fueled many cruise ships in her day; and we share the same home, historic Atlantic Basin in Red Hook, Brooklyn. Another connection between us is that our advisory board member, the noted maritime photographer Jonathan Atkin, aka shipshooter, will be up in a helicopter photographing the QM2 and us in the parade! One of his prior photos of the QM2 is at the bottom of this blogpost. We can use volunteers with all sorts of skills from shipwork trades to event planning, educators, web and graphic designers, grantwriters and more. Info here. 6 July 2015 On 14 July 2015, New York City will witness the conclusion of Cunard’s 175th anniversary commemorative Transatlantic Crossing as Queen Mary 2 sails into its U.S. home port for a spectacular finale. The arrival of the great Cunard ocean liner will be marked by a flotilla of historic ships and Coastguard vessels, including the Mary A Whalen, an oil tanker; the Eric R Thornton, tug boat; John J Harvey Fireboat; Nantucket Lightship, and the Pegasus Tug after she passes under the Verrazano Bridge at approximately 5:30 am and berths alongside the Red Hook Terminal at 7:15 am. This culmination will be the end of a journey that pays tribute to the original voyage made by Cunard’s first flagship, Britannia, as the company inaugurated the first scheduled mail and passenger service across the Atlantic on 4 July 1840. Cunard has been sailing in and out of New York City ever since the Hibernia first called in 1847, and the company is very proud to call Red Hook Brooklyn its home since 2006. Sites of the company’s earlier history and its relationship to the city can be seen through the Cunard White Star sign at Pier 54 and the Cunard Building at 25 Broadway, which was completed in 1921 and is considered a New York City landmark today. In the afternoon, Cunard’s 175th anniversary will be marked by the ringing of the Closing Bell at the New York Stock Exchange by the master of Queen Mary 2, Captain Kevin Oprey, as a testament to the economic and industrial achievements of the company, as well as to the future of the brand. “Cunard is pleased to contribute to the growing success, visibility and economic impact of the city and to be a part of New York's growing cruise business, which attracts international visitors from across the globe,” Meadows added. Later in the evening, a spectacular light and music show, designed by the acclaimed Quantum Theatricals, will mark the finale as Queen Mary 2 embarks on her return journey back across the Atlantic. The show, which will be cast over the ship, illuminating New York harbor and the sky above, will bring viewers on a fantastic journey through Cunard’s 175 years of history, as well as celebrate the future that lies ahead. This production will begin at approximately 9:30 pm as Queen Mary 2 holds position in front of the Statue of Liberty, and will be available for public viewing from Battery Park. Further information regarding these special events will be forthcoming soon. For more information about Queen Mary 2, Queen Victoria or Queen Elizabeth and to book a voyage, contact your Travel Consultant, call Cunard toll free at 1-800-728-6273, or visit www.cunard.com. Christened by Her Majesty The Queen in 2004, Cunard Line’s flagship Queen Mary 2 defines luxury travel for the 21st Century and continues an almost 175-year legacy of transatlantic travel. Queen Mary 2 achieved her 200th Transatlantic Crossing in July 2013. Famous names who have experienced this iconic voyage since 2004 include President George H.W. Bush, Desmond Tutu, James Taylor, Wes Anderson, Tilda Swinton, George Takei, Kim Novak, Uma Thurman, Richard Dreyfuss, John Cleese and Angela Bassett. Cunard, operator of the luxury ocean liners Queen Mary 2, Queen Victoria and Queen Elizabeth, has long been synonymous with the quest for new discoveries and the epitome of British refinement since the company's first paddle-wheeled steamer, Britannia, crossed the Atlantic in 1840. Cunard voyages bring together like-minded travellers who seek a civilised adventure and relish the Cunard hallmarks of impeccable White Star Service, gourmet dining and world-class entertainment. Today, Cunard offers the only regularly scheduled Transatlantic liner service and continues the legacy of world cruising which it began in 1922. Cunard is a proud member of World's Leading Cruise Lines. Our exclusive alliance also includes Carnival Cruise Lines, Holland America Line, Princess Cruises, Costa Cruises and Seabourn. Sharing a passion to please each guest and a commitment to quality and value, World’s Leading Cruise Lines inspires people to discover their best vacation experience. Together, we offer a variety of exciting and enriching cruise vacations to the world's most desirable destinations. Visit us at www.worldsleadingcruiselines.com. Photo by Jonathan Atkin of www.shipshooter.com. Atkin is on Portside newyork's advisory board. Special education event during the second week of June! PortSide NewYork is now in a position to expand educational programs! Literally! On May 29, 2015, we moved our historic ship, the tanker MARY A. WHALEN, to a publicly-accessible location for our first long term permit (3 years) after 10 years of looking for such a home. Our first program commitment is to reach out to educators to discuss educational programs we can create together. PortSide NewYork invites educators (K-12 and college) to visit our historic ship, the tanker MARY A. WHALEN, to discuss program ideas. This will enable PortSide to provide some of these programs to you and others by the next academic year. Looking for a new field trip? An educational enrichment activity? A hands-on experience in marine biology? New ways to make STEM topics exciting or to bring historical topics to life? Want to learn about NYC's working waterfront or superstorm Sandy, marine weather and preparing for floods? Let's talk! We want to brainstorm with you. Some wonderful ideas have been brought to us by teachers and professors in the past, and we have also created content on our own. All PortSide programs relate to water, waterfront or maritime themes in some way. They do not have to focus on the ship itself. Examples of some of the educational programs we have created in the past on our webpage Youth +Education. Educators are encouraged to make an appointment. Call 917-414-0565 or email portsidenewyork@gmail.com. Flat soled shoes recommended while on the ship. Public transportation: take B6 bus to Red Hook and get off the Pioneer Street stop on Van Brunt Street. There is no subway stop in Red Hook. Closest subway is F/G stop at Smith & 9th Street. Here are walking directions from the subway to the Pioneer and Conover street gate from hopstop. Starting in January 2015, the subject of the South Brooklyn Marine Terminal (SBMT) on the Sunset Park waterfront has prompted a lot of consternation - and confusion. The media coverage added more confusion than clarity with stories that were short on information and long on political speculation. New York City is the media capital of the nation, and it is also a city where none of the major media, as far as we can tell, has a waterfront reporter. Map from website from the axis group, the first sbmt operator selected by the edc which went bankrupt. The New York City Economic Development Corporation (EDC) sought a long term lease from the NYC Department of Small Business Services (SBS). This is the "Master Lease" often referred to, whereby control over the site was moving between one part of City government to another. "Master Lease" here does NOT refer to the EDC's leasing the site to an operator (a private-sector business) in this go-round. A prior lease was made with the Axis Group that was to run car importing on site, but Axis went bankrupt. Their webpage for SBMT was still live as of this May 20, 2015 here. The local Councilperson, in this case Carlos Menchaca of the 38th District, has, via the City Charter, the function of approving or disapproving such a transaction. Menchaca did not approve on round one because he felt that SBMT should not be planned singly, that its development should be considered along with other major developments in the area (such as Industry City) and that the multiple EDC sites in Sunset Park (which all tolled amount to an area as large as many neighborhoods) should be considered as a collective, and that the SBMT development should be planned to benefit the adjoining community in some fashion, and that a mechanism or new governing entity for ensuring that should be created. The latter concern was because, at some sites, the EDC's metric for success has been rent/revenue earned directly by the agency, an economic benefit which does not necessarily advantage the host community of the EDC site. Menchaca also felt that the EDC had some unfulfilled commitments in the 38th District and said he would withhold approval of an SBMT deal until those commitments were met. A home for PortSide NewYork was one of the commitments that Menchaca sought and secured. The resulting agreement between Menchaca and the EDC is memorialized in a Letter of Intent (LOI). Thefinalizing of this LOI is what greenlighted the City Council to have another hearing on the SBMT matter, following up on the December hearing, the first. A City Council hearing regarding SBMT was held on Tuesday, May 19, 2015. This was a hearing of the Subcommittee on Landmarks, Public Siting, and Maritime Uses. To watch the video, look for the link VIDEO on that page. The LOI between Menchaca and the EDC figured largely in the discussion. Our President Carolina Salguero testified for PortSide NewYork. We outline our understanding of the contents of the LOI in the Appendix at the end of our testimony. We copy our testimony in full below, or you download it as a PDF here. The five council members present voted to approve the Master Lease between EDC and SBS. Other councilmembers were present earlier in the hearing, some commented, some did not. This will be voted on by the entire City Council at the Stated Meeting scheduled for May 27. PortSide NewYork understands that the EDC-SBS lease discussion led Councilman Carlos Menchaca to work out a Letter of Intent (LOI) with the EDC that includes many terms beyond the SBS-EDC lease and the SBMT site itself. We summarize our understanding of that LOI in Appendix A, and our comments below reflect that understanding. We commend all parties who participated in the creation of the LOI: Councilman Carlos Menchaca for his vision, steadfastness and willingness to bring multiple parties to the table of future collaboration; and the EDC for listening, for evolving, and for making a strong staff commitment to the Sunset Park waterfront in their new restructuring. The Sunset Park waterfront is a regional asset that merits such focus. We applaud the EDC’s commitment to rethink the way it operates in communities where it has assets. PortSide NewYork is a living lab for better urban waterways. PortSide NewYork works to activate NYC’s waterfront, specifically the BLUEspace, the water part of it. PortSide shows how to combine the working waterfront, public access and community development. We bring the communities afloat (maritime) and ashore closer together for the benefit of both. We think it is key to state that the word “community” also applies to maritime, a constituency that can only be at the waterfront, not just the residential community ashore. PortSide’s Sandy recovery work won us an award from the White House and honors from the New York State Senate. The LOI is an exciting road map for the future of Sunset Park and of Brooklyn, and it may prove an example for The City. We applaud its commitment to holistic planning that will consider the whole suite of EDC sites in Sunset Park and that will integrate developments inside a site fence with what is outside it. PortSide applauds the development of a task force to influence the RFP for the SBMT site. We are excited that members of the shoreside community will be joined by maritime experts in this task force to help foster the creation of an RFP that reflects maritime market realities. NYC’s piers have lain fallow for a long time while the maritime industry, which includes non-profits like ours with historic ships, has strained to grow. All sectors of the maritime industry have been seeking space. The brownwater sector of tugs and barges; charter, excursion and diner boats; ferries and historic ships seeks space. The Sunset Park waterfront has also attracted strong interest from the bluewater sector, ocean-going vessels that import and export. In fact, there have been two offers to build a containerport in Sunset Park since 2001: Hanjin, one of the world’s largest shipping companies, offered to build such a port if they could run it, and a European concern proposed an automated port. Elements of this LOI reflect an exciting return to the spirit of Vision 2020, NYC’s comprehensive waterfront plan, created in 2010, which embraced the waterways and called for activating them for multiple stakeholders. The spirit of Vision 2020 was at risk of being drowned by Superstorm Sandy which turned water into a frightening force. The resulting flood of federal dollars for resiliency grew a defense-against-water mentality. Fortunately, there is a corrective as the resiliency planning conversation turns towards economic resiliency, and that conversation should foster activation of the waterfront for water-dependant and water-related uses which will grow economic, educational and cultural activity. Given the 9/11 waterborne evacuation of Manhattan (350,000-500,000 people) and the one during the 2003 blackout, plus the 2012 lessons of Sandy, planners should bear in mind that the most resilient pier is one that can host many uses, particularly boats, and that supports various emergency functions of evacuation and supply by water. Activating SBMT is a plus in this regard. The Port Authority is making a large investment in the Cross Harbor Project which has rail float bridges near SBMT and a rail line running to SBMT. SBMT is a regional marine rail transportation asset that should be developed with Cross Harbor in mind. We applaud the evolution in the EDC’s metric for success. PortSide has long advocated that the maritime industry and waterfront activation can offer substantial indirect benefits to the adjoining inland community. The LOI is a recipe for achieving such goals thanks to commitments to workforce development, the creation of a RFP task force, the installation of better fendering for the north side of the Brooklyn Army Terminal (BAT) Pier 4 which will allow more maritime activity on site, the aforementioned holistic planning, and funds from the SBMT lease to support local programming. PortSide looks forward to participating in the promises manifest in the LOI. • One of the LOI terms is a home for PortSide on Pier 11, Atlantic Basin in Red Hook with a three year contract. We thank Councilman Carlos Menchaca for his role in getting us our first real estate stability after a ten-year search for a home. • We would like to return to BAT Pier 4 and help activate the site for programming. • PortSide would welcome an opportunity to join the RFP Task Force. • PortSide has ways to grow indirect benefits of maritime activity including ways to make the maritime industry a neighborhood attraction and an educational amenity via PortSide’s “learn our infrastructure” ethos. • PortSide can share our Waterfront Policy Recommendations which further explains the ecosystem of the maritime industry and its needs. 39-year Master Lease between SBS and EDC. The EDC commits to restructuring with a new Executive Vice President position focused on Sunset Park assets, coordinating within the EDC and pulling from all departments and operating from an office in Sunset Park. The department will consider the effect of all EDC assets in Sunset Park; those are Brooklyn Army Terminal which includes BAT Pier 4, SBMT, Bush Terminal (the industrial park), the Meat Market and Bush Terminal Park. A mechanism to involve the landside community and maritime experts in the creation of a Sunset Park Waterfront Planning and Jobs Task Force that will shape the structure of the RFP to find an operator for SBMT. A customized workforce development program in Sunset Park created in partnership with local community organizations to connect residents to jobs created through activation of SBMT. Space for the docking of PortSide NewYork on Pier 11 in Atlantic Basin, Red Hook. 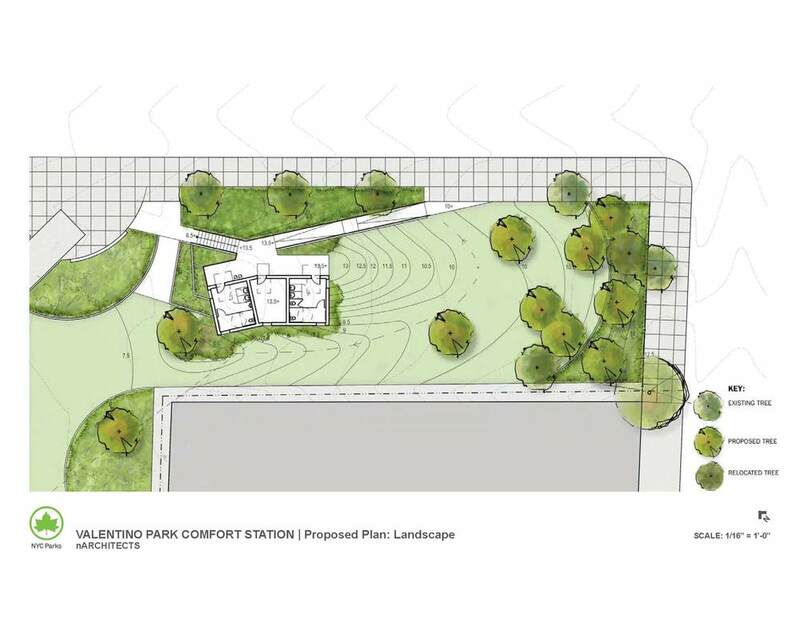 Valentino Park Comfort Station proposed Parks Department plan. This became so large, in part, due to FEMA requirements that a new building in coastal flood zone be elevated. Thinking of the Valentino Park and Coffey Park discussions, above is info about citywide discussions about ‪#‎parkequity‬ to get funding to underserved neighborhoods. Mayor Bill de Blasio will announce a new plan today with $130MM in funding to go to 35 parks. This is encouraging news in and of itself (we support more going to communities that have less) and seems like a good time to bring to citywide level one of the issues that our Valentino Comfort station has brought up, eg, how to keep costs down. $130MM will not go far if 4 toilet stalls cost $2.4MM. Let's find ways to engage constructively in a citywide discussion about how to improve parks for all. Better, cheaper, smaller potties for us could be the start of something bigger for all. All word play intended. It would be good for Red Hook to bear in mind, that though many feel this community was slighted for years, by now Red Hook has revitalized so much we are NOT as underserved as places like Brownsville are. Thanks to NYS Senator Daniel Squadron for his work on #parkequity and to Councilman Carlos Menchaca for bringing the New York City Department of Parks & Recreation to the community table for meetings about waterfront parks in Red Hook and Sunset Park. DOT has approved a sidewalk toilet. Red Hook, we have been heard! Remember all those meetings about a big, expensive "comfort station" proposed for our charming waterfront park Valentino Park? That concept was defeated, and a small, sidewalk toilet is coming via the DOT. Thanks to everyone for participating in public meetings, on-line discussions with us, and other modes. Community action worked! A special shout out to Anne Griepenburg who researched the Portland Loo which presented an alternative that appealed to many and may have swung government decision around to that kind of solution. Toilet Party any one? It has the great acronym of TP. We hear that there is a spring installation expected, but we are still waiting on confirmation. From Parks Department PDF. See link at left for full PDF. Wed 9/24 7:30pm, 351 Van Brunt St.
A meeting of about 40 people was held over about two hours. The meeting was designed as a community conversation meaning Community Board 6, Parks, elected officials or media were not invited. The Red Hook Star Revue was asked to leave. However, Peterson Napoleon, a staffer from NYS Assemblyman Felix Ortiz office was there which was only made clear after he spoke up midway through the meeting. He stayed. Given the request for the media to leave and some of the passions in the room, we do not mention names of speakers below when describing proposals, questions or statements people made. There was little interest in the meeting in the idea that one would be able to see the Statue of Liberty from the proposed Comfort Station as shown in this rendering. Saving the lawn was a far greater priority. A significant portion of the beginning of the meeting was spent venting frustration with Parks, CB6, the City, etc for not being sensitive to Red Hook. This was intertwined with discussion about how do we discuss this? Who moderates? Passions ran high. Things settled down and discussion got into various aspects of the Parks planning and outreach process, the status and amount of the whopping $2.4MM for the comfort station, who wants toilets and not, who is represented at the meeting and not, etc. Towards the end of meeting, there was a lot of discussion about how to capture the points in the meeting, share the info about the meeting and the Parks proposal with the community, whether to have another prep meeting before a meeting with Carlos Menchaca on 10/8 or 10/9; and discussion, pro and con, about the way Red Hook tackles planning issues and when to use anger or not. Too big, too expensive, in the wrong place in the park, bad for taking away green space, ugly, not sensitive to 19th Century buildings. What are the stages of this process? Meaning what happens moving forward so RH community can understand how we can or how much we can influence? “Can CB6 rubber stamp this without RH involvement?” was asked in various ways. There was some discussion about whether it was locals or visitors who needed toilets. Some people were of the “who cares about the visitors” persuasion, others not. Can a survey be conducted of the park users to see how many want toilets? This was a popular question. How locked in is the $1.4MM? Is it locked into that park? That project? View from the stair side or western side. $50,000 to use for Valentino Park is paid annually by Hughes Marine (a give back for the Police evidence lot on the Erie Basin breakwater). We were told this is supposed to be for Valentino Park but has been put in Parks general fund. It was suggested, too much agreement, that we need to get that pulled out of general and applied to Valentino. There was general, strong agreement that the price tag for this thing was too high. Design criteria: what are they for this design (from FEMA, to DEC, zoning, building code, etc) so we can propose informed alternates. Portapotties: Can seasonal portapotties be used rather than anything permanent? There needs to be more clarity about where street end and private property lines are on the Van Dyke Street side. Is there anything that can be used in that asphalt area or is that all private property? Love the lawn: The room was strongly for protecting the green and either wanted an absolute “don’t build on the green” or had a strong primary interest in avoiding building on the green. Those two points covered just about everyone there. There was strong appreciation for “natural” plantings and style of the park. DEC Do they have jurisdiction here or not? One speaker said that DEC has signed off, and that they did not. Garbage cans. More of them and cans for recyclables. One person said could those be bundled with toilets under category “waste” as a way to use the allocated funds for things other than bathrooms. Hose: Some way to wash down the fish guts etc on end of the pier left by fisherman. A hand-pump was proposed that used salt water to cut down cost (and disruption to park) of installing a line connected to City water mains. Beach: A way to make the beach more suitable for toddlers/small children. How was not clearly defined; the comment was that it seemed iffy for little ones. BoatBox PortSide’s BoatBox plans to turn the container used by the Red Hook Boaters into a better amenity for all park users, visiting kayakers, and the Boaters themselves. The current container came to service the park via work done by PortSide and the Red Hook Boaters; and the agreement was that Boaters had use of the inside and that PortSide’s program space was the outside of the container and that PortSide would take the lead there, consulting with the Boaters during the process. Est4te Four – there was a proposal to approach them and ask them to build the comfort station solution. There was a variation whereby someone proposed that, when Est4te Fou asked for their variance to build, that the community demand that they build bathrooms as their give back in the way that O'Connell had to provide public access to the waterfront and an esplanade. Brooklyn Bridge Park toilets by Jane’s Carousel These photos were requested but for some reason Benjamin Peikes photos posted on the Facebook page for Mary A. Whalen were not visible on the iPad or a phone. They are in this two-photo slide show. The City of Portland, Oregon has had a public toilet design process. Here are several links. Thank you Anne Griepenberg for the info about Portland's work posted to our Mary A. Whalen Facebook page. PHLUSH is also out of Portland. "PHLUSH believes that toilet availability is a human right and that well-designed sanitation facilities restore health to our cities, our waters and our soils." Red Hook's Valentino Park - Comfort Station yes, no or how? See January 2018 update at bottom. The Parks Department has proposed a large comfort station (bathroom) for Red Hook's small jewel of a waterfront park, the Louis J. Valentino Park & Pier. See our prior post about the Fall 2014 repair work Parks planned which caused the first round of consternation. Below we copy a post we made to Facebook on Tuesday 9/23/14. There were great comments and photos submitted in response and we'll try to get those over here when we can. Not everyone is on Facebook, and a blog post makes a one-stop link that can be shared widely, but the flurry of discussion on this topic, is quite a bit of work to follow! People for Red Hook Public Parks MEETING Wed 9/24 7:30-8:30p, 351 Van Brunt St. There are rising concerns over New York City Department of Parks & Recreation plan for a comfort station in ‪#‎ValentinoPark‬. Concerns focus on large size of the comfort station which wipes out a whole side of park that is heavily used, and the high cost (4 stalls = $2.4 million according to The Red Hook Star-Revue). The size seems to result, at least in part, from FEMA requirements that the building be raised, leading to the creation of a hillock, and then the required ADA ramp to reach that height also becomes huge. The landscaping plan prevents uses that currently occur in that section of the park. RECOMMENDATION Let's all approach this by asking questions and negotiating. Red Hook has the tendency to launch into angry accusations in public meetings - at the outset. That is not the best way to tease out alternatives (be they of design or of process). Anger blocks creative thinking (affecting community members trying to improve things), and the people in power are people too and it can be hard for them to be receptive to working with a community that is screaming at them. Anger should be the last resort. ALTERNATIVES? Could something smaller in size and cost be built-to-flood or "wet-proofed" as Andrea Sansom has proposed? Would incinolets solve the space/cost problem? If it is solar and wind powered by the designs that Baldev Duggal has created for the Brooklyn Navy Yard does it become more resilient or cost less? Someone said if the money is not used it is lost, well then, could money from resulting savings be used for other improvements to the park such as the BoatBox that PortSide designed as a better boathouse and outdoor living room for park users? The scale of the proposed comfort station does remind us of that Vietnam era slogan "we had to destroy the village in order to save it" by which me mean that an improvement to the park is wiping out a lot of the park. Carlos Menchaca got involved to clear up some misunderstandings about the Parks repair project which prompted the fences to go up, and we expect that he has already rolled his sleeves up to tackle the Comfort Station Matter. DOT has approved a sidewalk toilet. Red Hook, we have been heard! Remember all those meetings about a big, expensive "comfort station" proposed for our charming waterfront park Valentino Park? That concept was defeated, and a small, sidewalk toilet is coming via the DOT. Thanks to everyone for participating in public meetings, on-line discussions with us, and other modes. Community action worked! A special shout out to Anne Griepenburg who researched the Portland Loo which presented an alternative that appealed to many and may have swung government decision around to that kind of solution. Toilet Party any one? It has the great acronym of TP. We hear that there is a spring installation expected, but we are still waiting on confirmation.